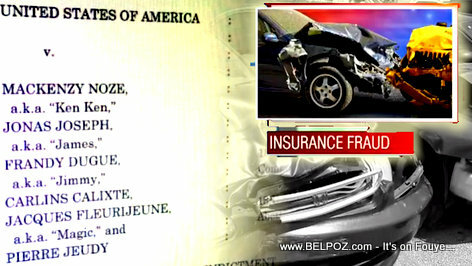 Mackenzy Noze is the name of a Haitian citizen in Norwich Connecticut was sentenced Monday in U.S. District Court to 48 months in prison for his role in staging car accidents in order to defraud automobile insurance companies. Evidence in court proved that Mackenzy Noze participated in at least 50 staged crashes where payouts typically ranged from approximately $10,000 to $30,000 per accident. After each staged accident, the defendants filed false property damage and bodily injury claims with various automobile insurance companies, according to the court. They then collected payouts on the fraudulent claims from the victim insurance companies.